The market has been especially resilient throughout 2017 as the ALSI managed to record repeated all-time highs against all odds. This achieved against a far-from-ideal backdrop of economic issues and political unrest is nothing short of remarkable. During a tough year in which we saw Naspers’s share price double, the biggest listing in JSE’s history - STAR - and the collapses of EOH and Steinhoff, the silver lining seems to be the election of Cyril Ramaphosa as the ANC’s new president. What we are hoping for is clear political leadership and a balanced macroeconomic policy that reduces the budget deficit, stabilises the debt trajectory, and promotes growth. 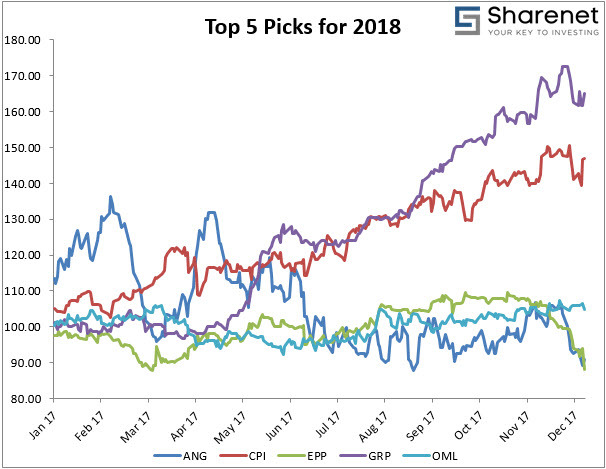 My top picks for 2018 are a good diversified basket of stocks with a bias towards local shares. The sectors range from listed property, through resources, to the financial sector. What I looked for is a combination of shares that are trading at a significant discount to their NAV (or target price) or that I believe will outperform their sector peers (Capitec), and are in sectors that I believe will perform well in 2018. These shares can be added to any portfolio to provide risk-reducing diversification benefits. AngloGold Ashanti is the third-largest gold mining company in the world as measured by production. It has 17 gold mines in nine countries, as well as several exploration programmes in both the established and new gold-producing regions of the world. The gold mining sector in South Africa is a difficult sector to operate in. Most companies in this sector have high-cost, structurally challenged mining operations, and AngloGold is no exception. What does count in ANG’s favour however, is that it is geographically diversified, one of the cheapest locally listed gold companies on relative valuations, is currently trading at a significant discount to its own historical multiple and also to international gold peers. ANG released a strong third-quarter update recently which has resulted in analysts increasing their target price significantly. This share represents amazing upside potential. Capitec is a South African retail bank which focuses on banking services and provides savings, transactional and unsecured lending products to individuals. Their business model is to provide value to their customers through low costs, offering the highest interest rates on deposits, and providing a simplified, innovative banking solution. It is currently the second-largest retail bank in South Africa. Capitec’s ability to attract new customers is one of the main reasons for its success. It has managed to attract, on average, more than 100,000 new customers every single month. This ever-increasing customer base offers an ideal opportunity for Capitec to cross-sell other financial products. This is especially significant since all other banks struggle to hang on to their existing customer base, never mind expanding it. Capitec’s surge in share price has been somewhat of a fairy tale so far. CPI has gained in all but one year since listing on the JSE in February 2002 at R1.80, increasing by 54,441.1%. Operating in an environment and an economy plagued by corruption and political unrest also seems to have had no effect on the share price. The share price has increased 41.3% this year alone. The unseen rise in Capitec’s share price has made it expensive compared to its peers, trading at about 20 times future earnings. However, Capitec has traded at a premium to its competitors since 2014 and its estimated earnings per share has risen regardless. We do not see any reason this should change any time soon, and I expect Capitec to surpass its target price. Echo Polska is a Dutch dual-listed real estate investment company. They invest primarily in retail properties throughout Poland. Their current portfolio consists of nine offices, 14 retails projects and two development sites in Warsaw. They have attracted significant international interest from investors and is a 100% rand-hedge for local investors. EPP only listed on the JSE on the 13th of September 2016 and is still quite new. It is not a share that is well covered by analysts, but this should change in the near future. During 2017, they decided to focus mainly on retail properties as opposed to a mix of retail and offices, because of strong potential in rental growth for shopping centres in Poland. Poland is one of the fastest growing economies in Eastern Europe. We note the recent announcement regarding EPP where they were informed of the detention of Mr. Przemyslaw Krych, who is a non-executive director at the company. He has responded by saying he is not guilty and intends to prove his innocence. The investigation seems to relate to Mr Krych in his personal capacity and not as a non-executive director of EPP. In addition, he is not involved in any day-to-day activities of the company. At this stage, there is just too little information and details regarding the matter to form any sort of opinion on it. We are still big fans of the company and maintain the opinion that it can perform incredibly well in 2018 and provides a great rand-hedge. We will keep you updated with regards to any new information as it arises. Greenbay Properties Ltd. engages in investment activities in the fields of real estate and infrastructure. It operates throughout the following geographical segments: Australia, Canada, Europe, United Kingdom, Singapore and the United States of America. The company was founded on 14 August 2014 and is headquartered in Port Louis, Mauritius. Greenbay recently made an offer to buy Group Five’s European operations for R1.6 billion. This is seen as a strategic move as they try to unlock value in the concessions business. Greenbay should be able to grow these assets by injecting the needed capital and using their operating experience in Europe. GRP has had an amazing year and its share price surged 69.2% in 2017 alone. It is my personal pick for the property sector, and one that in my opinion will continue to do very well going forward. Old Mutual is a UK-based holding company. Their business activities include life assurance, banking, property and casualty. Old Mutual is currently busy with its managed separation in which it will be split into four independent businesses, namely: Old Mutual Emerging Markets, Old Mutual Wealth, Old Mutual Asset Management, and Nedbank. Old Mutual will also cut its stake in Nedbank from 54% to 19.9%. This process is set to be complete by the end of 2018. The main reason behind the separation is an attempt to get rid of the discount at which it has been trading in the market. The group estimates that it is trading at a "conglomerate" discount of 15% to 20% and analysts are still not sure why the market has not re-rated the share in anticipation of this managed separation. This whole process should enable the underlying businesses with a real opportunity to grow and establish their own independent identities.